under the Company’s profile on www.sedar.com. (“VR”) and mixed reality (“MR”) markets. lower margin parts for older generation VR programs. representing a decrease of approximately 3% from the prior quarter. to continued cost reductions and expense management. improvement from the $2.1 million EBITDA loss in the prior quarter. unit for gross proceeds of approximately $2.3 million. of 36 Data Center design-ins to date. Data Center deployments in China. Cables for connecting to enhanced 4K and emerging 8K displays. Molex, a major Data Center Interconnect supplier. order backlog on the books to be shipped in the fourth quarter. historical and future financial performance. restructuring expenses, impairment expenses and other one-time expenses. 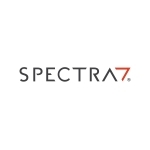 additional baseline for analyzing trends in Spectra7’s operations.